When you will visit Kiev, а capital of Ukraine, it would be good for you to take a day to visit a great piece of Ukrainian beauty, a Kovalivka village, located in Kiev region. 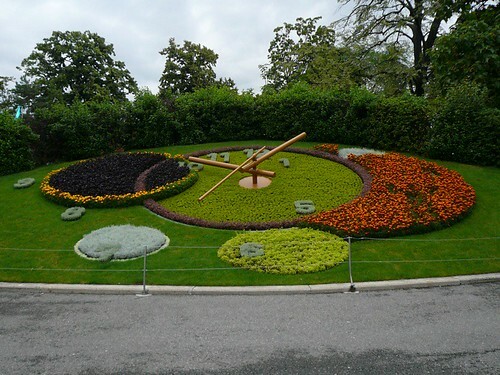 There you can see amazing floral clock, only floral clock in Ukraine. It was made after 1994. Nice story about making of this clock. Kovalivka’s people decided to put their floral clock exactly on place where first house of Kovalivka was built. The name “Kovalivka” was created from Ukrainian word “koval”. “Koval” means “smith” by Ukrainian. So, in 16 century young smith had built a house on piece of land. It was first house there, beginning of stable settlement. People gave a name Kovalivka to this village. Now the floral clock it is memory of the first man, who started to build a village. The clock has a very symbolic name “Clock of Eternity”. It is one of the tourist’s attractions of Kiev region. A guests of Kovalivka loves to take picture near the “Clock of Eternity”. The floral clock shows an exact time, it is manages by computer program.Also you can take a look at other world known floral clocks, on Niagara (Canada) and Geneva (Switzerland). Floral clock, originally uploaded by Florence3. Kyiv The Ukrainian Capital Has The World’s Biggest Floral Clock!